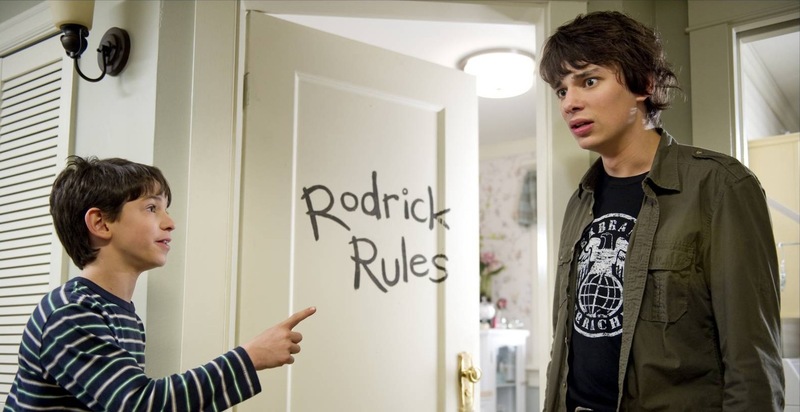 Appeasing solely to children, "Rodrick Rules" is the kids movie that parents will hate and kids will love. Made for fans of movies made for kids and the "Wimpy Kid" series. Rated PG for some mild rude humor and mischief. Before seeing Rodrick Rules, I was certain that the second Wimpy Kid movie would simply be more of the first. If you remember my review, I hated the first Wimpy Kid. I am, of course, unfamiliar with the books. To my surprise, assuming they are the same, each Wimpy Kid deals with its lead character(s) learning and growing from a lesson. In the first, our antagonizing protagonist Greg Heffley was constantly taking advantage of his chubby best – and only – friend in an attempt to better his lowly social standing. This round, Mom is forcing Greg and his wild older brother, Rodrick, to leave their enemy past behind to form a brotherly bond. My biggest beef with the first was that Greg was more of a “prick kid” than a wimpy kid. While he still isn’t exactly a “wimpy kid” in Rodrick Rules, he sure isn’t the jerk that he was in the first – at least this time he is not throwing his fat friend under the bus, this time his victim is a weird little Indian kid. The first Wimpy Kid movie got the series started, but the story would now better serve a television audience. As they are, the movies are already overly episodic. Every five to ten minutes, another disconnected chapter begins and ends. Simply fade to black after each “episode,” add a commercial spot, link two “episodes” together and Fox would have a perfectly timed 30-minute Saturday morning series filled withe all the poop and underwear jokes any kid would want. While Rodrick Rules is better than the first, is still isn’t a series suitable for entertaining the whole family. The childish potty humor will cause the adults to constantly check their watches, wondering why they didn’t drop the kids off and see something else.